Last week, I produced this segment for MSNBC.com about Ms. Gwendolyn Baxter and the young people she works with at the Greater Roseland Community Committee’s Youth Voices Against Violence program. I witnessed one of their circles, where they open up and share about the toughest issues facing them in their neighborhoods. The topic of the day was gun violence, and why saying what you witness when you see a crime is not snitching (a fear that keeps many murders in the city from being quickly solved). 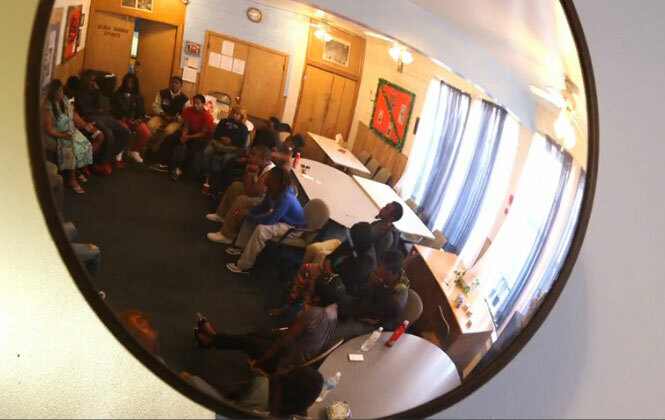 A mirror above the room in the New Life Baptist Church in Roseland, Chicago, reflects a circle of youth discussing the effect of gun violence on their lives.